Shelly LeGere says she knows nothing can bring her daughter back, but through her family's tragedy, she's now determined to help others. "I don't want another parent to have to go through what my family has gone through and Annie's friends," she said. It was in August of 2015 that 13-year-old Annie LeGere was at a friend's house for a sleepover when she had a sudden allergic reaction. "I arrived at the house, which was not even five minutes from my house, and her classmates ran out to me and said, 'Mrs. LeGere, she's not breathing, she's on kitchen floor," Legere said. 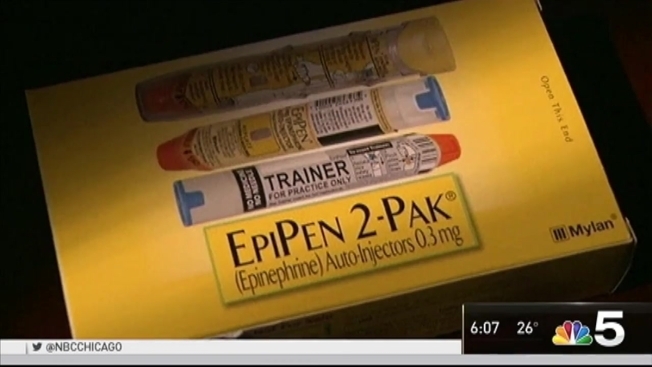 An emergency shot of epinephrine with an EpiPen could have saved Annie's life. But the officer who showed up didn't have one, and Annie didn't survive. "She was without oxygen for too long and her brain had irreversible damage," LeGere said. Shortly after Annie's death, her parents started the Annie LeGere Foundation, which donated $40K to the DuPage County Sheriff's Office on Tuesday. That money will be used to buy 92 pens for the department and first aid kits in the jail. "It will provide precious minutes to those suffering from anaphylaxis until advanced care can be rendered," said Col. Frank Bibbiano of the sheriff's office. The newly-passed Annie LeGere Law also allows for first responders to be trained on how to use and administer EpiPens - a practice that was previously prohibited in Illinois. LeGere said she suffered the ultimate loss, but it's her work to help others that she focuses on now. "If this can help save even one child, which I know it already has, or an adult, or anybody it lessens the pain for me," Legere said Tuesday. "She loved me to the moon and back and I loved her, and I always will."